“Ho ho, ha, ha,” the loud hoarse cry ripped the stillness of the night, followed by a loud beating of tin cans – the sound bouncing off the hillside. The noise jerked me wide awake. Instinctively I grabbed for the gun, my heart in my mouth. In the frantic lunge, the torch slipped through my hand and I swore to myself. Groping around in the darkness, I found it lying on the floor of the machan, my lookout post several feet up from the ground. I waited with bated breath for something to happen but a deathly hush descended over the night. I learned in the morning that the night-time racket was intended to keep the wild boar from destroying the crops. For close to four hours I had crouched on the machan with a shotgun on my lap and a torch in my hand, lying in wait for that night’s quarry – wild boar. I kept vigil patiently throughout the night, though I became more uncomfortable with each passing minute. The late July night after the rains was relatively cool but, to my great misery, the mosquitoes were out in force and my skin crawled at the thought of the leeches around my ankles, gorging themselves on my blood. The wild boar hunt for me and two partners was more of a mission than an outing. The location was Bhirkot, a small village just 12 kilometers from the heart of Kathmandu. The year was 1990. We were supposed to shoot the wild boar that were destroying the villagers’ crops. I’d never heard of Bhirkot until one day Ramesh, my shooting companion and a doctor, told me about it. He had a patient from Bhirkot who bemoaned the havoc wreaked by wild boar in his village. That was all the enticement we needed. Hunting fanatics that we were, we set off for Bhirkot the following weekend, intent on remedying the situation. Nirmal, the third member of the group, joined us at the last moment. Barely a half hour ride west of Sitapaila to Ramkot, then a 45 minute hike uphill to the north, Bhirkot was a cluster of 30 to 40 houses, scattered amidst terraced fields on a hillside. A stunning view of the Kathmandu Valley dominated the southeast and the towering ridge of the Nagarjun Forest Reserve, a haven for wild boar, flanked the northeast. The landscape west of the village stretched into the forested hills of Bhimdhunga. Once at the village, Govinda, our host and Ramesh’s patient, assured us that it was okay to shoot the boar as they were declared pests and the village had special permission from the government. Our arsenal for the hunt included an odd assortment of 12-gauge shotguns. Ramesh carried a Russian-made Baikal single-barrel that, when fired repeatedly, became flinchingly hot. Nirmal sported an antique British gun, a 34 inch Greener inherited from his father, which often jammed at the wrong moment. I was fortunate in having a double-barreled Webley & Scott, also British, that gave me an edge over my mates, as I could go for a quick second shot if need be. Our visit to Bhirkot confirmed that the plight of the villagers was for real. At several locations, the maize crop – or what remained of it – lay trampled and chewed every which way we looked, as if entire fields had suffered a massive typhoon overnight. We wondered how the boar managed to get into the fields, confined as they were to the forest by a sturdy-looking boundary wall. We made a tour of the fields and found that the wall was not high enough in places to frustrate the sinewy legs of the wild pigs and, worse still, it had caved in at several locations. The wild hogs apparently stormed the fields in pairs or groups, covering as many as eight to ten different spots in a single visit. Not in daylight, though. Smart and wary, they bided their time until dark. If the damage caused by the boars’ night sorties continued unchecked, I could well imagine what would remain of the crops at harvesting time. At night, villagers kept guard by turn, empty tin cans were beaten to scare the swine away and, with the help of government shikaris, or hunters, a few of the animals were even shot every year. “A prolific breeder, a sow bears five or six piglets up to twice a year and the gestation period is just four months. The government does not allow hunting and, although the forest does have some leopard, they have been ineffective in reducing the numbers. As I bid him goodbye on my way back to the village, he mumbled some words of thanks for my having kept the night watch for him. The poor fellow must have slept well for the first time after a long time, since I had relieved him for the night. I knew that neither of my companions lying in wait 200 yards apart had had any better luck, as no tell-tale gunshot was heard during the night. Ramesh, however, had a hair-raising account to tell. Around midnight, he heard a boar barely 20 paces from where he was crouched amidst the maize plants. He stalked it in darkness, virtually crawling on all fours, until he thought he could all but reach out and touch the animal with his bare hands. Unaware of the danger from Ramesh, the boar kept chomping at the cobs, the sound like small crackers going off in the calm of the night. Shaking with nervous excitement, Ramesh squinted into the dim moonlight to locate the source of the noise. He knew that to venture further would put him in danger, for wild boars are treacherously aggressive. And he could not shoot at the sound alone. Ramesh made a frantic gesture to a frightened villager, who was bringing up the rear, to switch on the torchlight but, before the poor chap could train the light on the quarry, the boar spooked. The startled animal made an explosive dash, brushed past Ramesh and was gone in a dim blur in the moonlight. Last to appear that morning was a weary Nirmal, with bloodshot eyes, droopy shoulders and disappointment written all over his face. He, too, had had a bizarre encounter. “I saw not one but two of them,” he told us. After an uneventful, all-night vigil in a tree, Nirmal climbed down along with his village companion and headed for the village. As they trudged down a slope, he heard people talking in the distance. 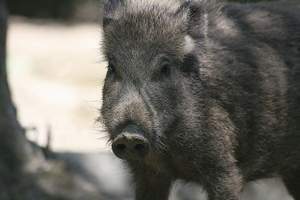 It never occurred to Nirmal that a wild boar might cross their path, highly unlikely as it was for it to hang around after daylight and in the proximity of humans. But one did. Caught unawares, the two men froze in their tracks as their eyes locked on a big boar hardly ten feet away. So much for our wild boar hunt. Back at the village, as we sipped tea at Govinda’s house he graciously soothed our spirits by assuring us of good luck the next time. We thanked him and the many villagers who had thronged to bid us goodbye and set off down the slope towards home. As I lay in the comfort of my bed that night, musing over the sequence of events at Bhirkot, the face of the old man kept flashing in my mind. He was at that very moment probably sitting it out on the machan, fighting a wretched battle against the crafty wild critters.